I'm not sure what it is about me liking tough pieces this year, but I was craving some distressed jeans. This was the exact wash I was looking for and the perfect amount of distressing. I picked these to wear for dinner and cocktails with a high school friend that was in town for work. We went to this amazing specialty burger place downtown and afterwards walked to a sports bar with a live band covering 90's music. 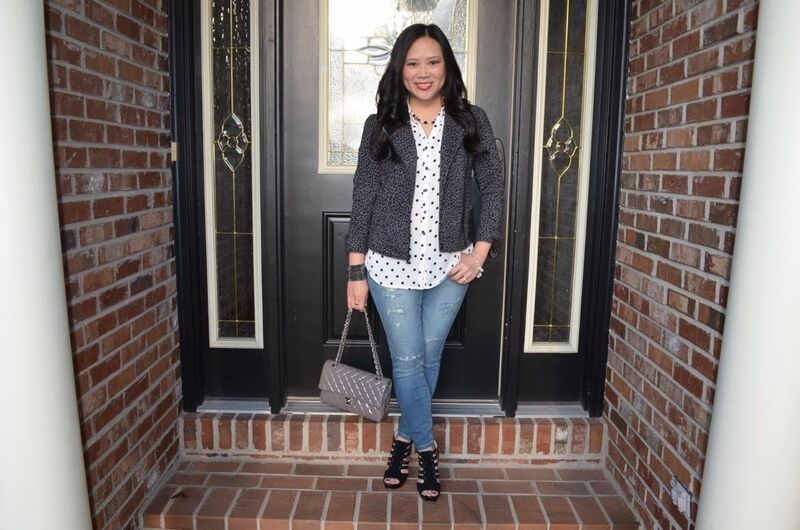 I decided to pair these jeans with my dot blouse (which I have a feeling will make many appearances on this blog) and a cotton moto jacket because it was windy and in the 50's last night. Distressed jeans and a moto jacket naturally need some hard hitting shoes. 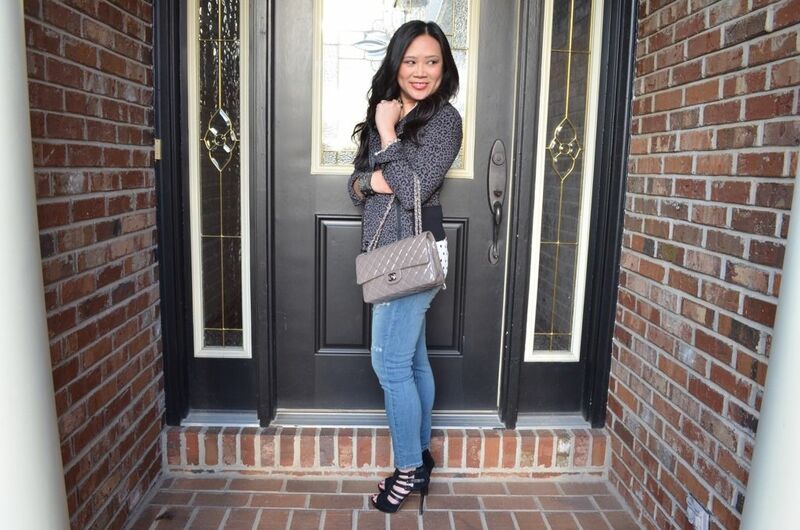 These black suede platform sandals with infinite buckles were the piece de resistance! This Chanel is the most prized item in my closet room. I'm trying to take her out more and not wait for special occasions. I felt great - I really loved this outfit a lot. Nothing super special, but the combination of all pieces was just right. And for the record, I literally walked a whole mile in these shoes and my feet didn't hurt one bit! I love that! 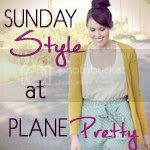 I'm linking up for Sunday Style and My Style Monday. 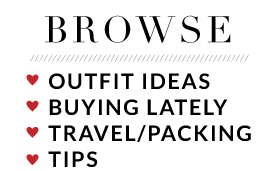 Check out the other looks and join the link up parties yourself! I think it's an adorable outfit. I think polka dots are my favorite of all the patterns, and I really like how you "roughed" it up here. Those shoes are amazing! Thank you so much! And I agree - dots are so great! I love your whole outfit! The jacket is such a great piece. I've been depending on my leather jacket like crazy this spring. 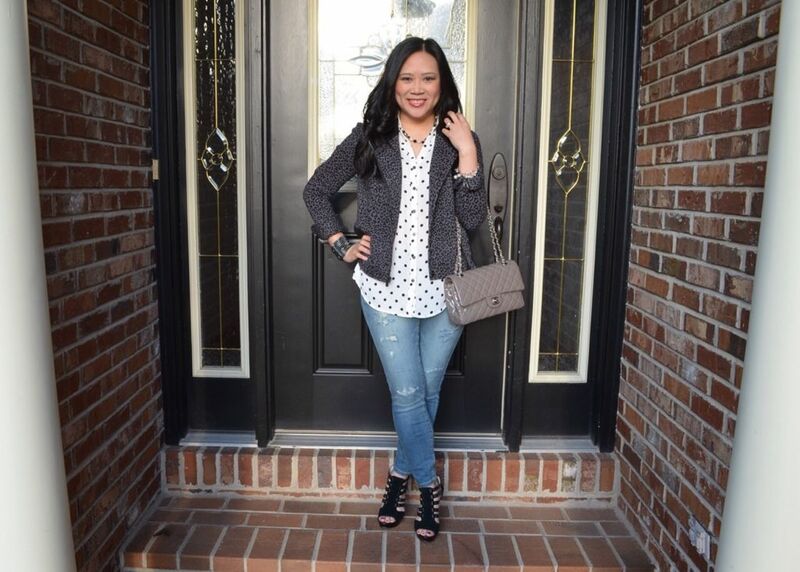 The polka dots are such a great addition underneath, and I love your bag! 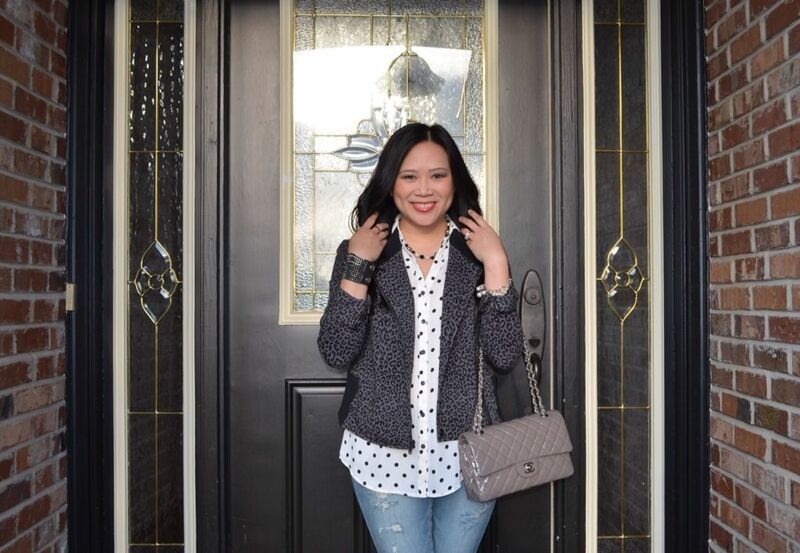 It doesn't get much better in my book than a polka dot shirt and a moto jacket :) I found too that often my 'simpler' outfits end up as my favorites! Simple is good for sure! And thank you, Erika! This really is the perfect wash for a distressed jean. I love how you styled them too! Thanks! I'm completely in love with these jeans. It took all my strength to not wear them again today! I love those shoes--but what's most impressive is that they don't kill your feet! Thank you! And I agree! I actually mapped out my walk to see how far I traveled and was surprised when I saw it was a full mile. Seems ridiculous to walk a full mile in heels, but it happened, and these were great! Gorgeous blazer! And it's the perfect fit with those killer shoes! You're making me want to pull out my distressed jeans again. Hope you pull them out, too! Ha! Thanks for the sweet note and for stopping by! 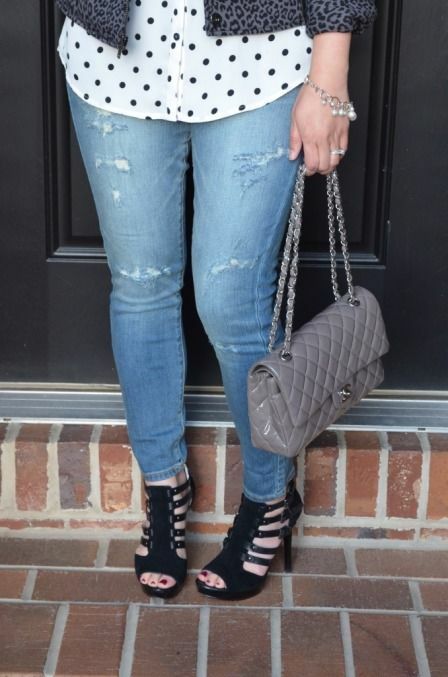 I agree, I love a distressed jean! Love your heels too! Thanks and thanks! I appreciate the comment, Lindsey. 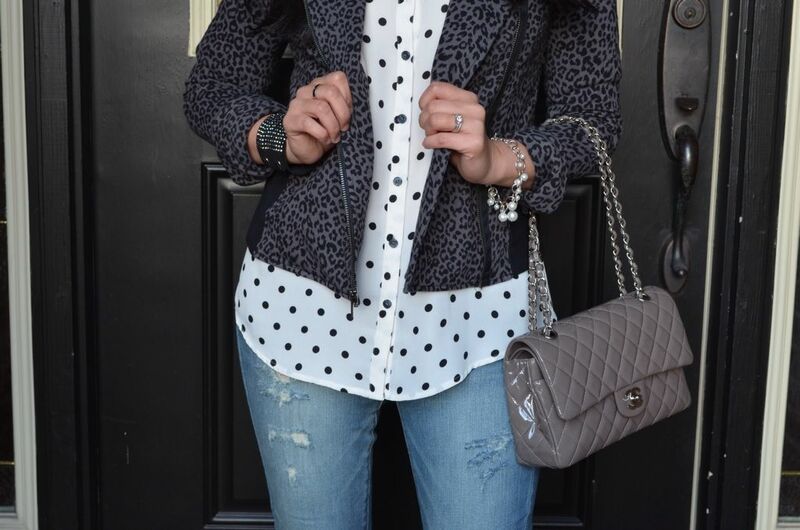 I love these jeans + heels, and what a fun jacket print! =) Great outfit! Thank you very much! I was iffy about the jacket at first, but so glad I purchased it after all! Loving this outfit. I adore polka dots!!! Found you through the link up. Check out my blog for a stella & dot giveaway and join me this Thursday April 25 for my link up. I will check it out - thanks, Agi! I love the pattern mixing! 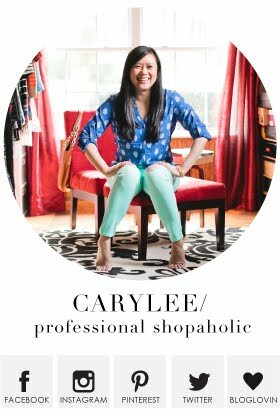 I am hosting my weekly blog hop right now, and I'd love for you to stop by and link up!